Posted by Cora Hall on February 9, 2019 in Hockey, Sports, Top Stories. So the beat goes on: Ferris hockey drops another overtime loss, this time to the Bemidji State Beavers. After a tough pair of losses against Lake Superior State University (LSSU), the Bulldogs needed to take home some points if they wanted to compete in the postseason. Bemidji, ranked No. 6 in the Western Collegiate Hockey Association (WCHA) standings, came into the game off a bye weekend and split their last series, which happened to be against LSSU as well Jan. 25 and 26. The Beavers have fared better in conference play than the Bulldogs and carried a record of 11-8-1 going into the matchup, while Ferris sat at 4-15-1 in conference play and No. 9 in WCHA standings. Falling behind 3-2 in the third period Friday, Feb. 8, Ferris senior forward Trevor Recktenwald’s last second goal would force overtime for the seventh time for Ferris this season. The teams fought until the final seconds of 3-on-3 overtime when Bemidji netted the game-winner and took home the first game of the weekend. Recktenwald said it was big for the team to come back and overcome the deficit in regulation. In the first period, the game remained scoreless until the last few minutes, when Bemidji’s Tyler Kirkup scored to put them up 1-0. Bemidji would also begin the second period on a power play from a boarding call against Ferris sophomore forward Lucas Finner in the last seconds of the period. Ferris head coach Bob Daniels said the team did not take care of the puck in the first period and it resulted in a lack of offense. Less than two minutes into the second period, the Bulldogs got on the board and tied the game up 1-1. The short-handed goal was scored by Ferris freshman forward Hunter Wendt, assisted by sophomore Coale Norris and senior defenseman Zac Tierney. It wasn’t long after that the Bulldogs scored again, this time from Finner, assisted again by Norris. Bemidji failed to answer the two goals and trailed Ferris in shots at the end of the second 21-16. The teams came across a unique situation in between periods when the ice failed to freeze over after the Zambonis went over the rink. The officials did not delay the game before the second period but they delayed the game before the third period started for nearly ten minutes. Daniels said that while it’s no excuse, the delay affected the team’s focus. The Beavers tied it up 2-2 in the beginning minutes of the third with a goal from Bemidji sophomore defenseman Tyler Vold, and a few minutes later they would take the lead 3-2 on a goal from Bemidji freshman forward Alex Ierullo. With ten seconds left in regulation play, Recktenwald made the game-tying shot to force overtime against the Beavers. 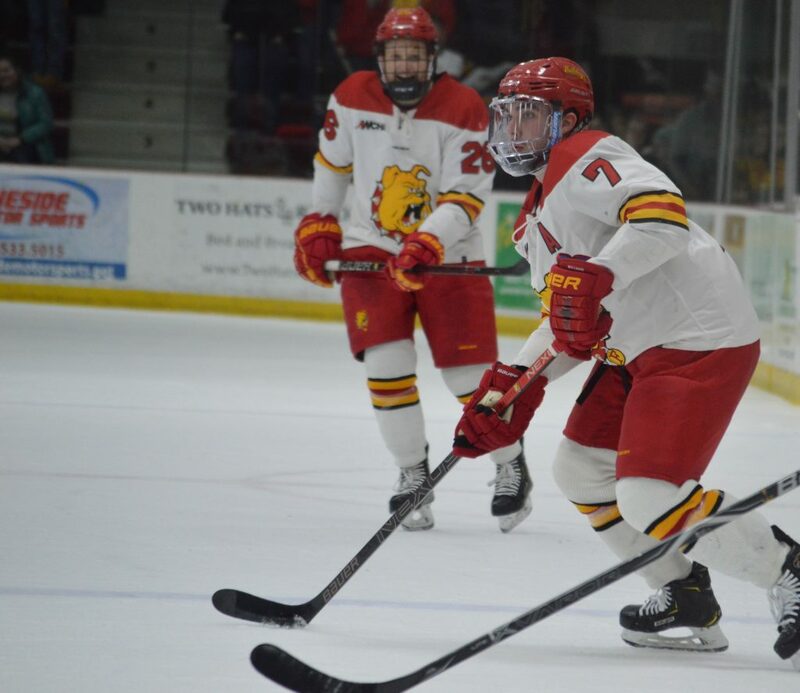 There were a couple big opportunities for the Bulldogs in overtime from Ferris junior defenseman Nate Kallen and Ferris freshman forward Justin Michaelian in the 5-on-5 portion, but none found the back of the net and the game went into the second overtime period of 3-on-3 play. Bemidji sophomore forward Charlie Combs would score in the final seconds of the 3-on-3 overtime to win the game, but Ferris still took home a point in the contest in front of 1,101 fans. The puck drops again 7:07 p.m. Saturday, Feb. 9, at home for the second game of the weekend series against the Beavers.